LTI stands for Learning Tools Interoperability. LTI is a specification published by the IMS Global Learning Consortium with the goal of providing a way for different learning tools to talk to each other and work together. Moodle (a Learning Management System, or LMS) and Questionmark (an Assessment Management System, or AMS) integrating their functionality is a perfect example of the concept. So far in this series, we’ve looked at using SCORM or AICC to do a simple launch-and-track, and in the case of SuccessFactors, a simple Single Sign On (SSO) from the Learning LMS into the Questionmark Enterprise Manager. This is a very high-level integration. The assessment is simply launched and reports back to the source of the launch. The SuccessFactors SSO requires some manual intervention to set up an admin ID within Questionmark – the connection doesn’t just happen “automagically”. The LTI Connector allows for a much deeper integration. 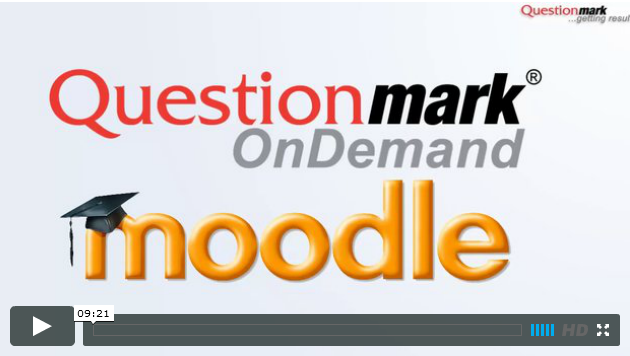 As you’ll see in this video, once the LTI Connector is configured in the Moodle environment, a Moodle instructor can log into Moodle and add a Questionmark assessment to a course – from within Moodle, without having to have an ID and password and log into Questionmark at all. Similarly, a student can log into Moodle and launch a Questionmark assessment – again, from within Moodle, without a second set of credentials. Furthermore, an instructor can also use Questionmark’s authoring and reporting functionality – you guessed it – all from within Moodle. The LTI Connector allows for a deep integration with Moodle, giving the instructor and student a seamless experience in what behaves to them like a single environment, even though they are actually moving back and forth between Moodle and Questionmark.